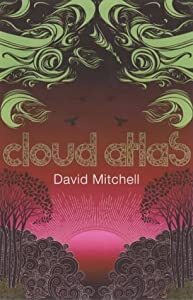 The talk I’d been hearing about Cloud Atlas from the time of its publication in 2004 was that it was both brilliant and a difficult read. So although I purchased the book in January, I left it parked on my bedside table for several months. I wasn’t tempted to begin reading it until I learned the Wachowskis (formerly the Wachowski brothers) had made a movie of it. Both a story in The New Yorker about the making of the movie and a long trailer for it on YouTube heightened the intrigue. Thus I finally undertook to read the 509 page tome. Since I was under the assumption the book would be hard to get into, I was pleasantly surprised to find that wasn’t the case at all. I should state up front that I tend to read at face value—especially the first time around—rather than with the intention of fitting all the pieces of a puzzle together. So if I’m reading a mystery and can figure out whodunit before the author reveals it, I consider the story to have been poorly plotted. In the case of Cloud Atlas, I noted the links between the characters living in different time periods and tolerated the abrupt passages from one section to another, even when they came mid-sentence. But I wasn’t trying to work out the meaning of it all. This was my first introduction to David Mitchell, and I initially felt that he did an outstanding job writing in multiple genres and holding my interest with each new storyline. At least that was my impression when I posted my movie review of The Words, wherein I made a brief, favorable reference to Cloud Atlas. That was before I reached page 239, which begins the section titled “Sloosha’s Crossin’ an’ Ev’rythin’ After”—an entire 70 pages written in dialect! I’ve taken a number of writing classes and workshops and have read dozens of books on fiction writing. It’s pretty well ingrained in my brain that the guidelines for using dialect in a novel can be summed up thusly: don’t do it! The reason to avoid dialect is quite simple. Dialect makes it hard on your readers. It slows them down. It takes them out of the story. As a writer, why would you want to do that? Don’t you want your readers to maintain their suspension of disbelief? Don’t you want them to be so engrossed they can’t put the book down, even if it is 509 pages long? If you’re David Mitchell writing Cloud Atlas, you’re already a little on the ropes with your readers with your Russian doll story architecture. So why would you also force them to slog through 70 unrelenting pages of dialect smack in the middle of the book? Had I not been committed to seeing the movie to find out how the directors dealt with the multiple time periods, I would have given up on the book after the first 10 pages of “Sloosha’s Crossin.’” As it was, I kept thumbing through the section to find out how many more pages there were. I even skipped paragraphs and whole pages here and there, mumbling dark thoughts about the author’s self-indulgence. Just because you can do something doesn’t mean you should do it. I finished the book, but my annoyance over those 70 pages turned me off to the point where I could no longer suspend disbelief enough to get back into the other stories. When I got to the end, I did not have any epiphanies—and probably wouldn’t have under the best of circumstances, given the conclusion—I just slapped the book closed, relieved that I had made it through. My next thought was that I really need to reread One Hundred Years of Solitude. By the time I went to see Cloud Atlas, the movie, it was with the same trepidation with which I’d begun reading the novel. However, that experience was much more satisfying. Tune in next time for my totally rant-free take on the movie. I’m so glad you saved me from reading the book and looking instead to the movie. Thanks. I hope you get a chance to see the movie soon.